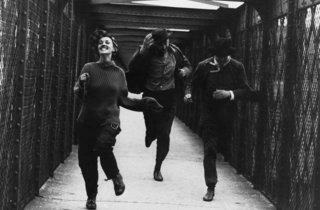 In 1962, the French New Wave’s most avid bookworm released an adaptation of Henri-Pierre Roché’s novel ‘Jules et Jim’. It was François Truffaut’s second adaptation (and his third feature film) but this one was special: the young tyro director and the art collector from another era (Roché had died in 1959, aged 80) came together like, well, Jules and Jim. Roche’s autobiographical story of a Frenchman, Jim (Henri Serre) and a German, Jules (Oskar Werner) whose friendship survives World War I (where they fight on opposite sides, terrified that they will kill one another) and their adoration of the same impossible woman, Catherine (Jeanne Moreau) becomes, in Truffaut’s hands, a paean to passion and an ineffably elegant flick on the nose to convention. The filmmaking is wildly inventive, but not in a Godardian, clever-clogs manner. Instead, Truffaut and his cinematographer, the great Raoul Coutard, use handheld camera, freeze-frames, newsreel footage and song (Catherine’s ditty, ‘Le Tourbillon de la Vie’ [Life’s Whirlwind] became a hit) in the same way the trio of characters use races, bicycle trips or, in Catherine’s case, unpremeditated jumps into the Seine: to keep life (and cinema), crazy and beautiful at all times. Despite its name, this is Moreau’s film: gorgeous, capricious and dauntingly destructive, she makes a fabulous whirlwind. There is great sadness in ‘Jules et Jim’, what with the war, Catherine’s betrayals and the nebulous tragedy that is growing up, for those who can manage it but, after the whirlwind has departed, it’s the joy – the sense of plunging into life – that remains. Disappointing. I love Truffaut but not this one.